Click here to join the Roomba Community, For the latest news, tips, reviews, and technical discussion about the Roomba Robotic Vacuum cleaner and the new Scooba Washer. 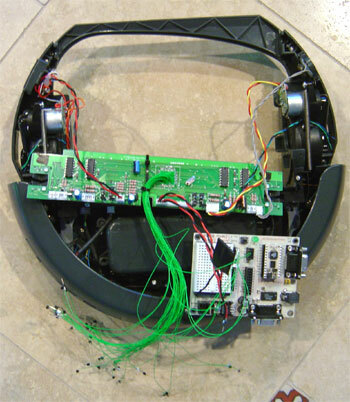 Ever wondered what is inside your Roomba. Here are all of the parts which are interesting to robotics enthusiastiasts (i.e. no vacuuming parts). 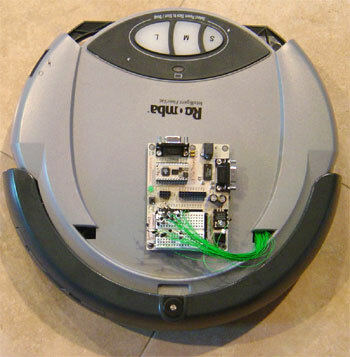 Hacked Roomba using a Parallax Javelin Stamp to replace the microcontroller. Inside view of the roomba. The micro has been desoldered and every pin has a flylead for 'experimentation'. At the moment the Javelin is connected to the bump sensors, motors and speaker (sound is very important!). Roomba Scooba and iRobot are trademarks of iRobot Corporation.